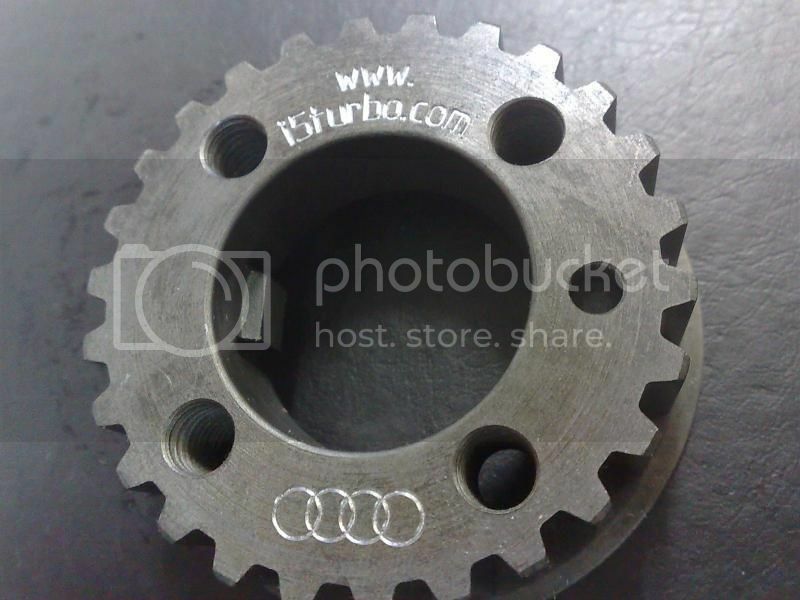 This thread is intended to be a one-stop-shop for everything you've ever wanted to know about Audi I5 crankshaft cogs. 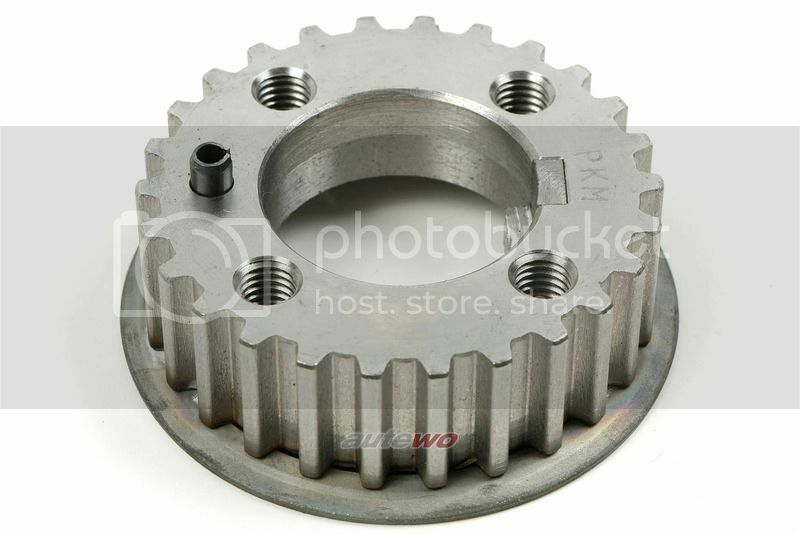 Also known as crank sprocket, pulley, gear, etc. 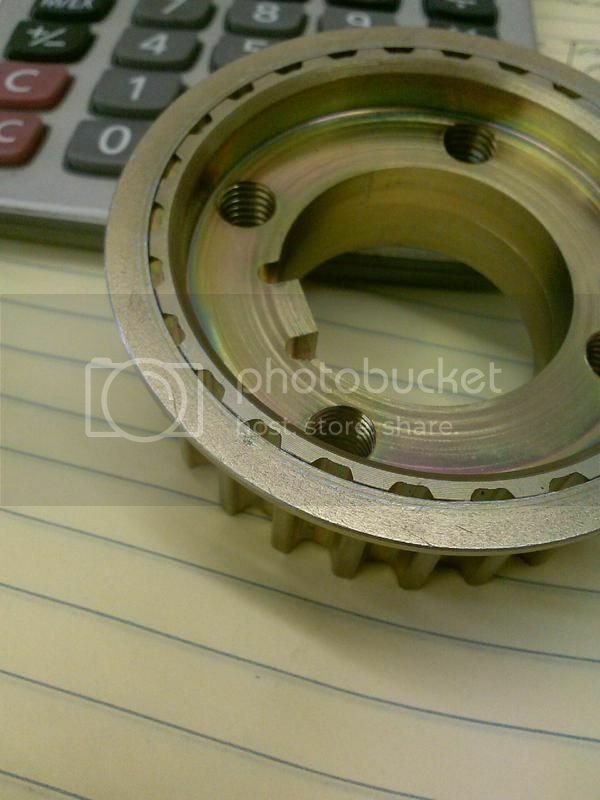 It is well-known and documented that when doing a timing belt job on an Audi ur5pot, whether that be AAN, 3B, ADU, ABY, 7A, etc. 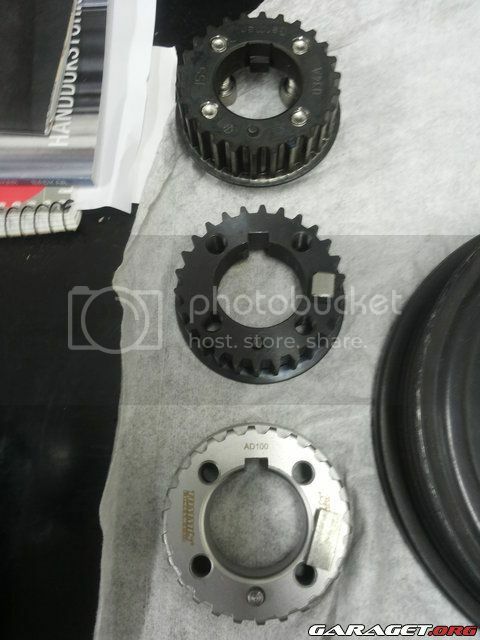 the crankshaft cog must be replaced with a new one because the stock gear is made of sintered steel. Sintered means the material (in powdered form) is put under tremendous force and heat such that the material fuses together. This creates a part with questionable strength properties, especially when exposed to impulse loads. 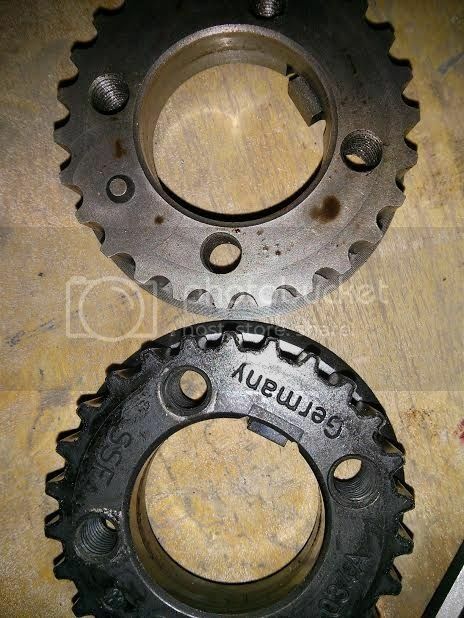 Using one of these stock cogs is perfectly fine when installed properly, but they should should be replaced with every timing belt service and using an impact driver to install them, without a crankshaft locking device at least, is NEVER a good idea. 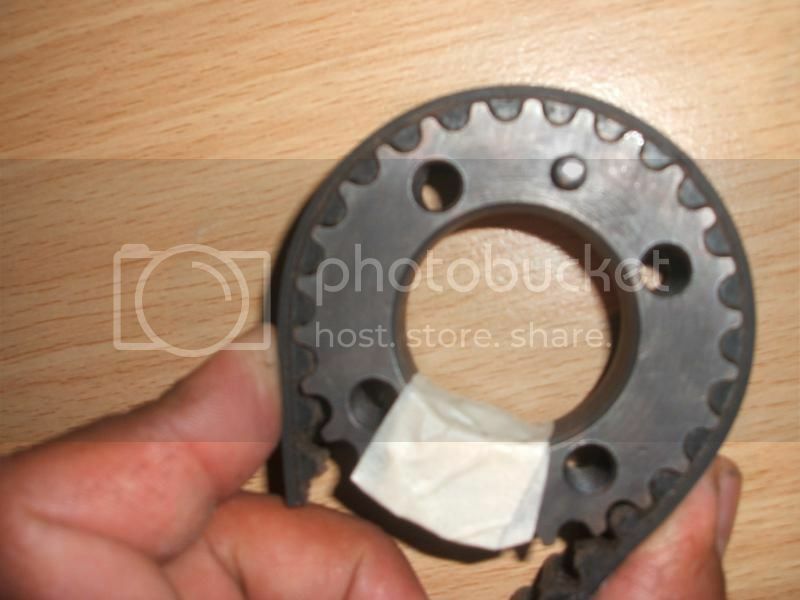 Instead of buying a new one every time the timing belt is changed, why not just make a much stronger version? Well, several have done this. However, the information about these high-strength cogs is not readily-available or so far spread out that it'd be nice to be able to take a look at it all in one place. Also, when you do have the information in-hand, how do you choose which one to use? That's exactly what this thread is for! Availability: Order anywhere you normally get your parts. Still readily available. Advantages: Cheap and guaranteed to work perfectly when installed correctly. Disadvantages: Made of sintered metal which makes it prone to cracking. One time use for safety. 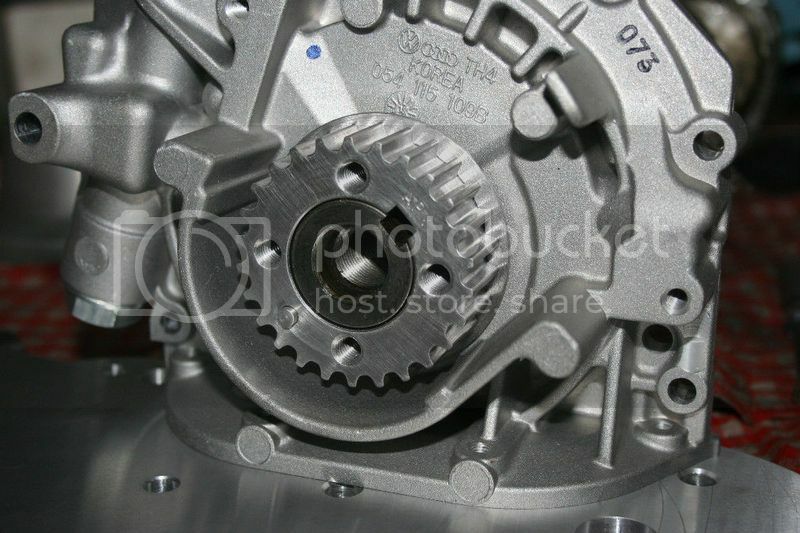 Stock cog with belt wrap. Notice the cracks! 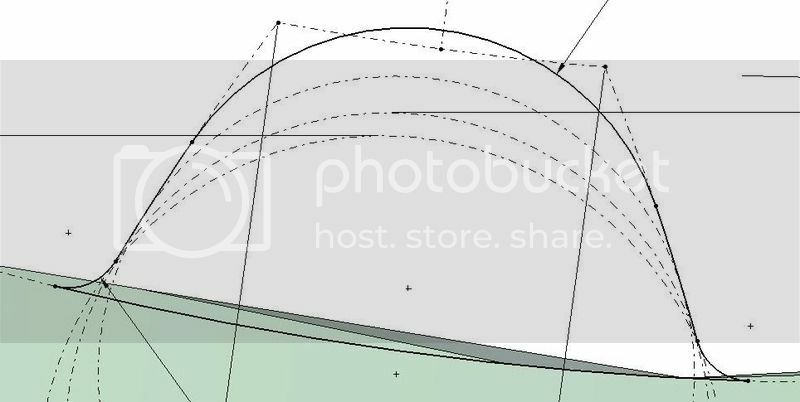 Tooth Profile: Squared-off teeth, correct valleys? 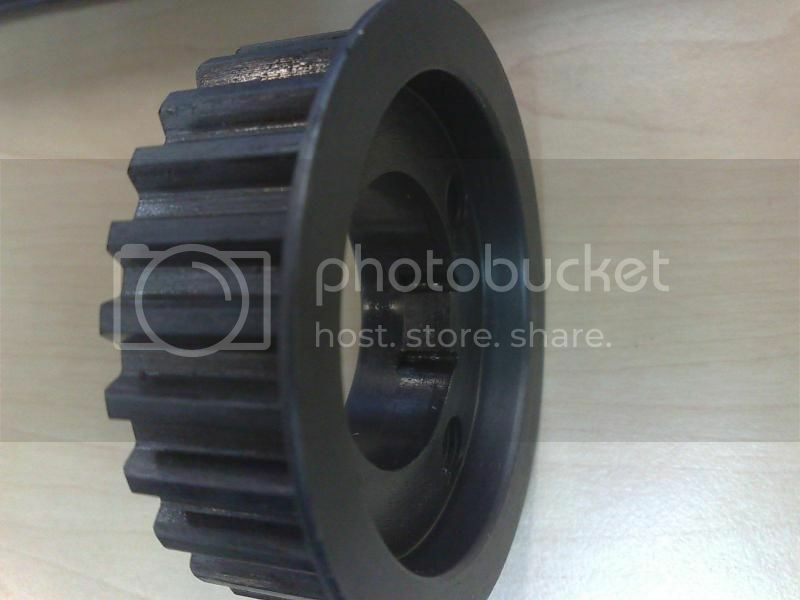 Disadvantages: At least one user has reported that the teeth of the gear are not timed correctly with the clocking of the holes for alignment with the crank pulley. 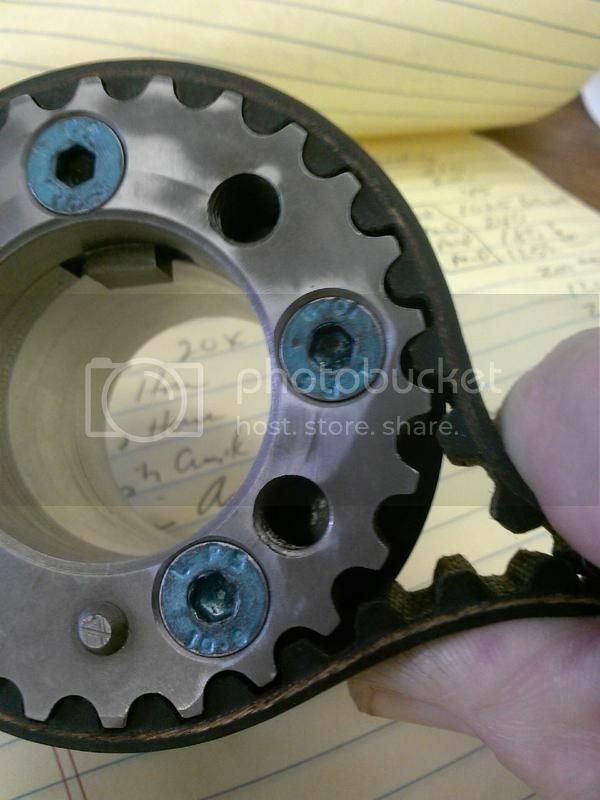 This makes setting timing and adjusting belt tension nearly impossible with a stock cam pulley. 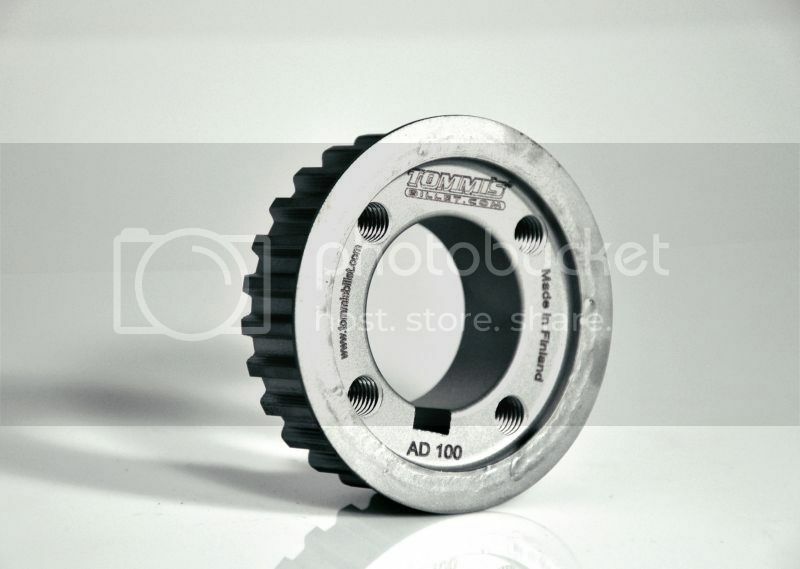 Also, the teeth are not rounded at the top like the supertorque belts are made for. This could cause premature wear on the belt. Look very closely and you will see that the edges of the teeth are angled rather than rounded. 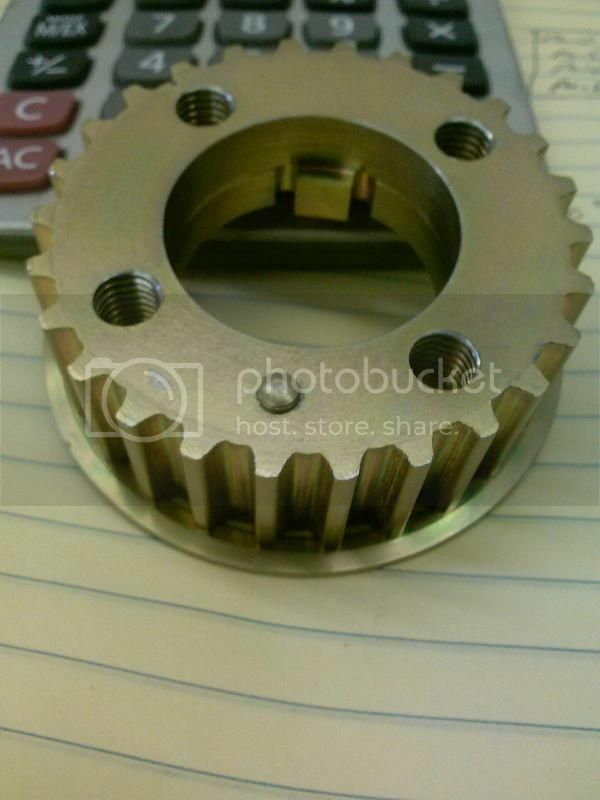 Don't let the curved front face of the gear fool you into thinking they have a curved profile. Price: $200 plus shipping. Could go lower in quantity. Availability: I could have more made if anyone wanted some, but I think there is a better option. 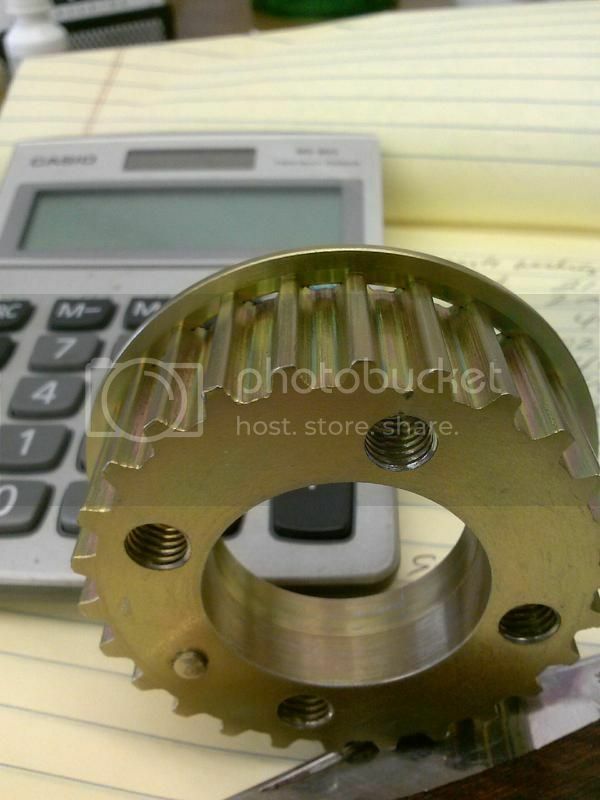 Advantages: Among the strongest of all gears using heat treated 4340 steel. Ground inside diameter to ensure perfect fit onto crankshaft. Top tooth profile is exactly the same as stock, rounded “super torque” style teeth. 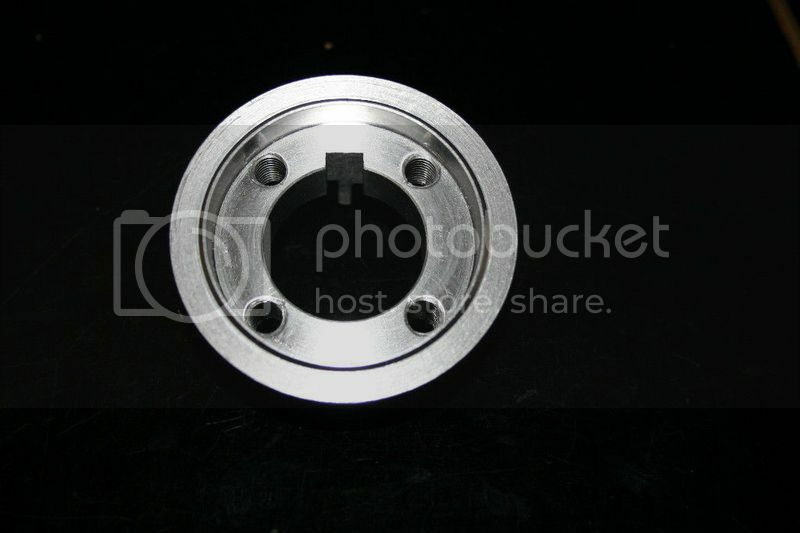 Machined dimple for crank pulley alignment. 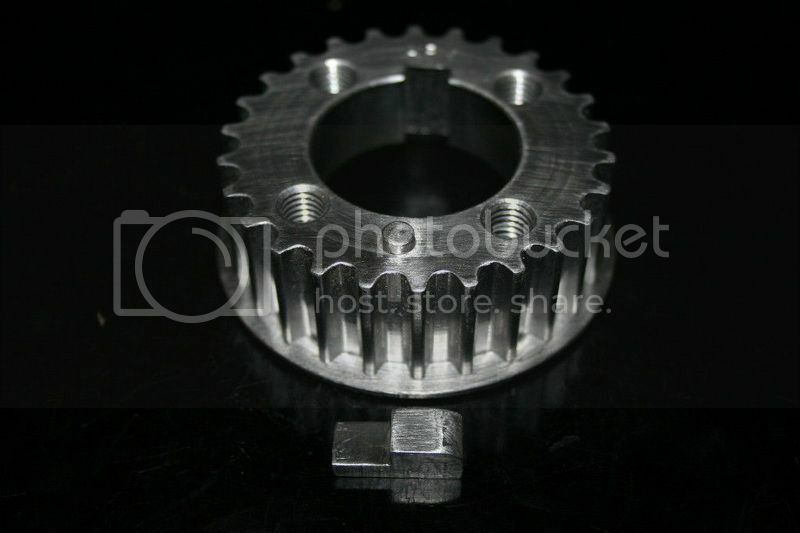 Can be made more cheaply than most of the other gears here because of the milled teeth (rather than cut by gear), although testing still needs to be done on this tooth design with respect to long term reliability and power-holding potential. 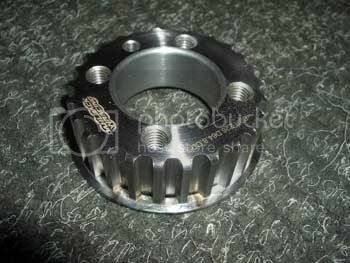 Advantages: According to fcarspec1 on quattroworld, it uses a separate key that slides a little deeper into the crank notch than the stock key. Disadvantages: Possibly not available. I have only seen one in this picture. Tooth design looks like it could be "off." Advantages: Cheap!Comes in wider width as well for using 25 mm belt. Appears to have correct, rounded teeth. Disadvantages: Teeth appear to be squared off and not the "super torque" style even though it is advertised as such. I could be wrong though. If so, belt wear will be accelerated. Material: EN19T tool steel. Some (not all) heat treated and have corrosion-resistant coating. It seems that all the latest ones were coated at least. Availability: http://www.s2forum.com/forum/showthread.php?t=32516 It seems they may not be made anymore. Advantages: This is the gear EFIexpress use to sell. It was of good quality. The only questionable thing is the teeth, but they haven't seemed to cause any problems. Disadvantages: No longer in production?? 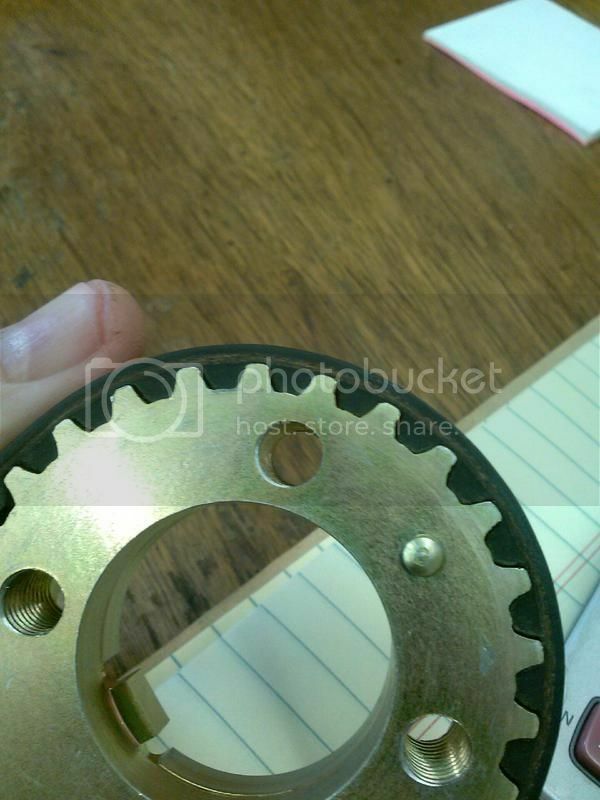 Appears to have sharp, squared-off edges on teeth rather than rounded. Advantages: Appears to have very nice teeth in the correct profile. 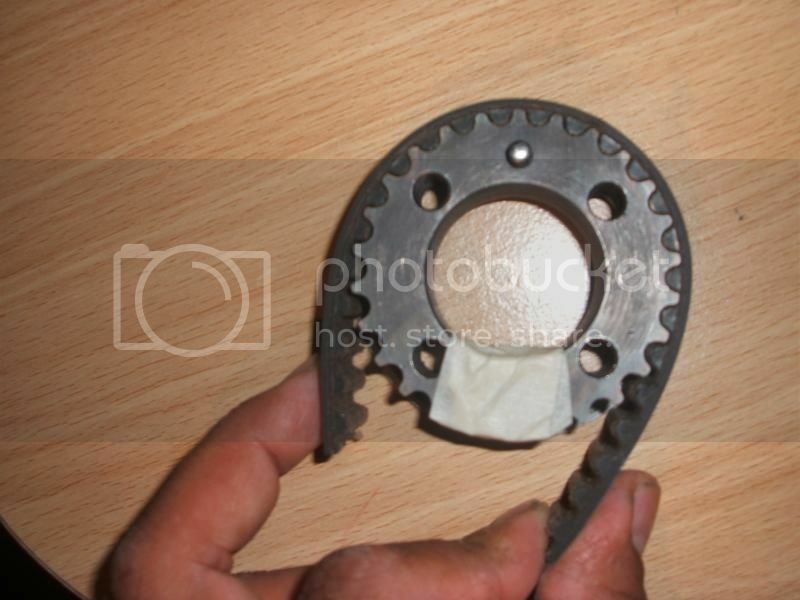 Seems to be well made by an experienced machinist judging from pictures. Disadvantages: Seller may or may not ship to US. Advantages: Appears to have very nice teeth in the correct profile. Disadvantages: The separate key and rolled sheet metal pin are... cheap. It may be perfectly functional, but I prefer integral pieces and precision machining. It makes you question the quality of the rest of the gear. Last edited by loxxrider on Tue Oct 06, 2015 1:11 pm, edited 6 times in total. Oh nice! That one appears to have all the right elements. The only thing I don't like about it is the separate key, but that's just me. Nothing wrong with it, I just like the integral key better. Thank you Chris! Awesome and informative info! Wow! THANK YOU! I love you man. 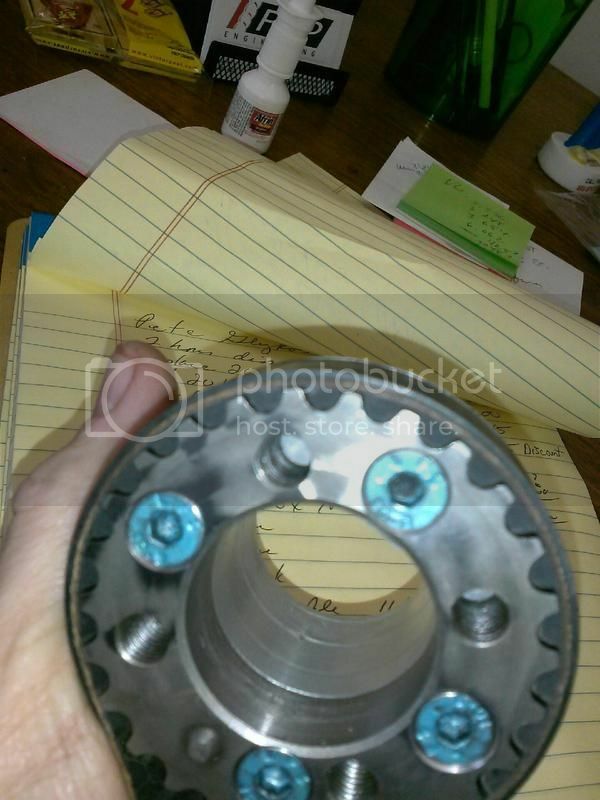 Thanks for the write up i only sent Issam two over for him and Jeff for there motors, so no one other than my self has stock of these pulleys at the moment. The Price is lower than some my mark up is not massive i do it more for the love. I am working on a adjustable gear and this will be available late fall i hope. A really nice bit of kit this will be i am pretty excited to get mine on my motor! James, I have updated the information to reflect that the gear should be bought from you. Very cool that you're making an adjustable version. I will add it when you have finished it! Also added another option from PKM. I just bought one from 034 and they actually sent me a Tommis. I think that means they no longer make their own? James (terrybullwon) has them available and ready to ship (at least as of a few weeks ago). Cheaper than 034's including shipping from the UK. And arguably the best design out there. Thanks for compiling all of this information loxxrider. I've reached out to James (terrybullwon) directly. Is it really that big of a problem? The crank cog on my JT has been on and off several times with an impact gun and that was 100k+ ago... odometer reads close to 380k now. Maybe it is just people using really weak crappy guns from Sears or Harbor Freight with only 100psi air pressure from their little pancake air compressors and the gun sits there rattling and rattling and rattling instead of just ZIP off and on? 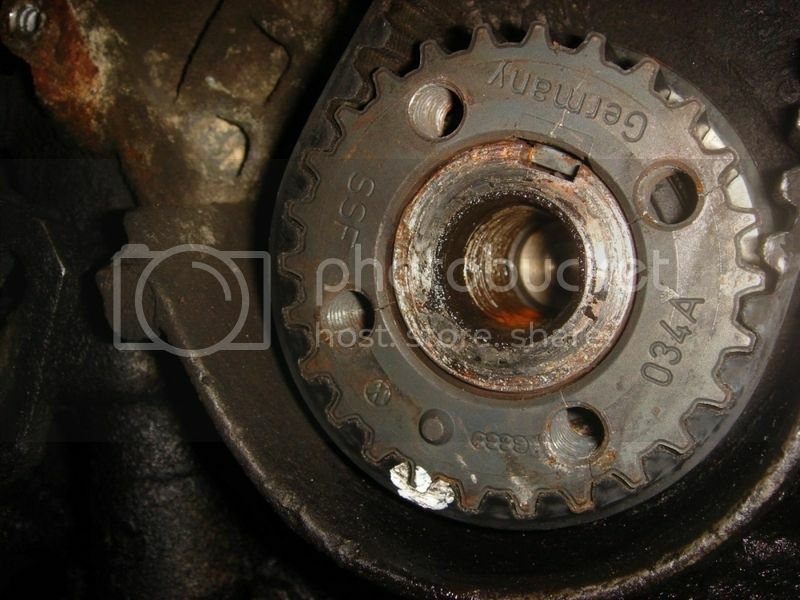 Or is it more of a problem with being insufficiently tight because people aren't checking the torque with a torque wrench, and the harmonic damper bolts to the crank cog, and long crankshafts in high power engines make a lot of torsional vibrations working that critical junction loose. Look at the other end of the crank... eight 10mm bolts to hold the flywheel in place, and you know that isn't for the torque because the driveshaft is held on by six spindly 8mm bolts and there is torque multiplication before you get to that point. I have long suspected the pulley itself being out of balance causing all kinds of problems. 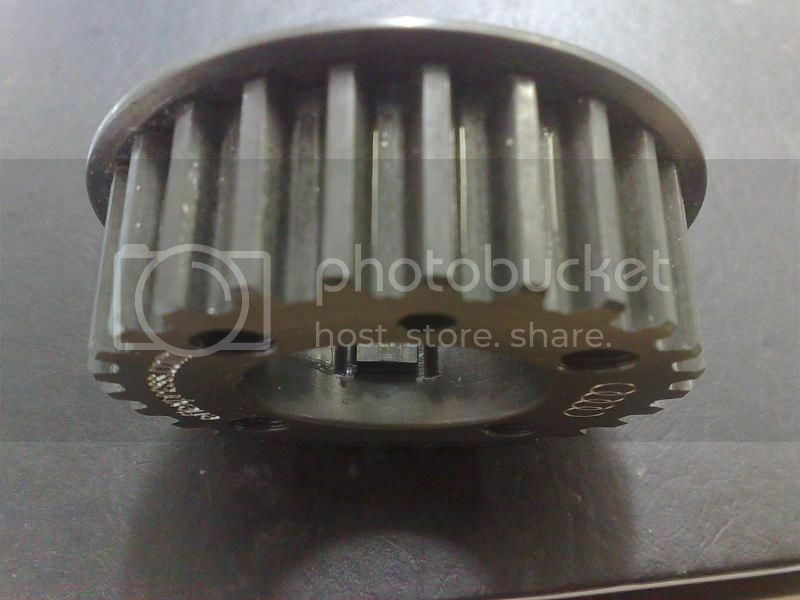 For example, I zero balanced my old 034 pulley along with the rest of the motor, with the trigger wheel welded to it, and it seems to be the only specimen to have lasted past a couple thousand miles. It's probably 30-40k and still going. I always wonder if the crank cog failures. are related to small vibrations. k2exoman wrote: Thanks for compiling all of this information loxxrider. 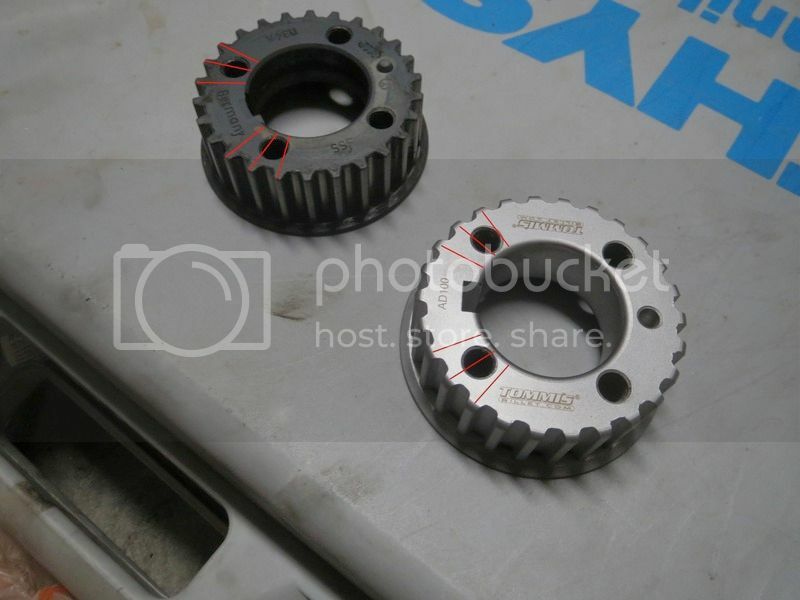 Yep Thanks k2exoman your pulley was sent and should be with you in the next week or so. Nice fair and objective compare. Good job! I've purchased two gears from James -Terrybullwon. TOP NOTCH! I also had an issue with shipping, and James resolved it quickly! Thank you very much!! 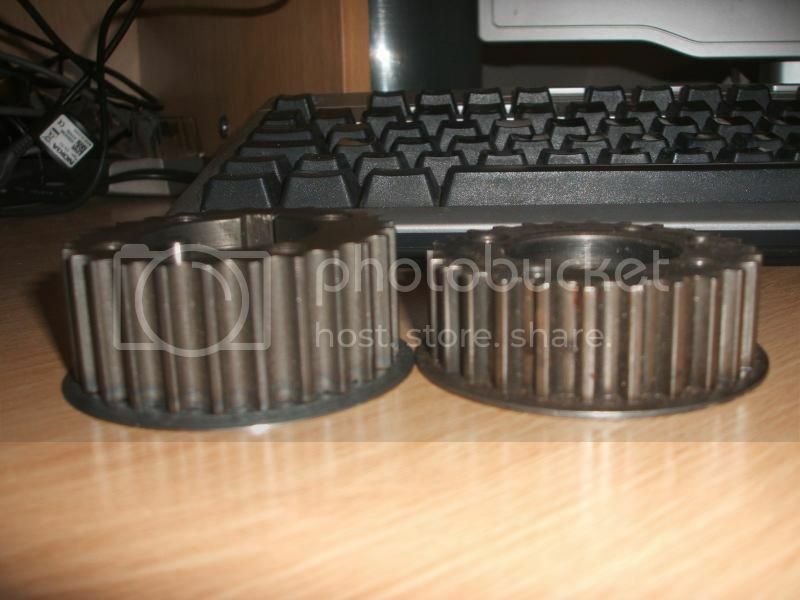 Hey guys, sorry I had to bump this thread, I wondered if any of you recalls of a guy on a forum or a company making crank gears for 10V engines ( part 035105263C ) ?